We hope you all had a very Happy Thanksgiving. We have so much to be thankful for I can’t even begin to list it all. Just take a look at this beach which is only 15 minutes away. 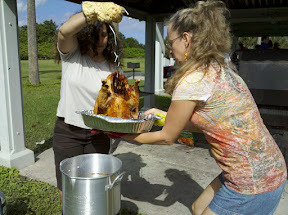 We had our Thanksgiving celebration at Birch State park, just across from the beach. Lots of family and friends and good food and a stunningly beautiful day. Thank you Jo Ellen for putting this together. My 40th High School reunion took place this month. It was great fun to see old friends. Surprisingly, I found out that I was one of the few who have attended every reunion we’ve had! That tells me something about myself – connections with people are very important to me. I never pass up an opportunity to keep those connections alive. I think that’s why I like Facebook so much. Now I have a few more High School friends that I know I’ll stay connected with because we are Facebook friends. The day after Thanksgiving Jim and Dee Walters pulled into the RV site right next to ours. They are also fulltime RVers that we met a few years ago and we’ve had fun spending a little time and getting to know them better. 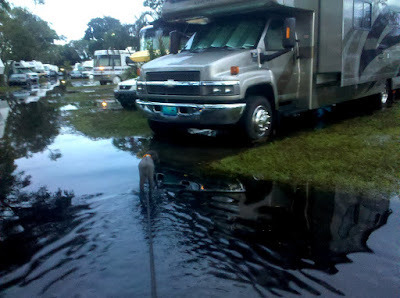 Dee agrees with me that an RV is meant to be moved more often than every two months! Dee keeps a blog too – Tumbleweed-JimDee.blogspot.com but she does a much better job at writing regularly! She posted about our evening yesterday where we actually dusted off the Wii and had some fun. Thanks Dee for motivating me! 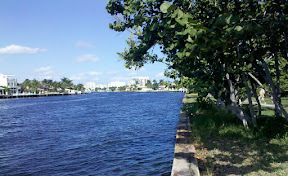 It’s been a quiet week here in Fort Lauderdale, Florida – my home town. Excersise: The flooding made me miss my Monday morning visit to Curves, but I’m proud to say that I successfully completed visits on Tue/Thur/Sat then instead of my planned Mon/Wed/Fri. One thing that made me join is the fact that I’m not locked into any particular times for a class. It’s a half-hour ‘circuit’ of workout on resistance machines and aerobic moves. It’s SO easy and quick, there’s just no excuse! I haven’t lost any weight yet, but I already feel stronger and I get less out of breath already. Here’s hoping I keep it up. There are Curves all over the country – I’ve even noticed them in those little one-gas-station-towns everywhere. So, I should be able to work out even when we’re on the road. Our Web Business: Sometimes it’s easy as a walk around the block, just put one word after another, and sometimes it’s like pulling teeth. This last Geeks on Tour Newsletter was the latter! I’m supposed to produce a main newsletter every month – but my prior one was August! I finally got the September/October newsletter published on Tuesday, November 1. Whew! Anyone who signs up or renews between now and the end of the year can lock in that measly $39 price by using our ‘Subscribe Now’ button that starts a new auto-recurring payment. As long as they don’t cancel it, that $39/year rate will last indefinitely. Tonight I was playing with my blog, [and other software.] You already know that your 8 seminars at Perry in March have made this "computer stuff" one of my favorite pastimes. But it occurred to me tonight that you and your show-me videos have also given me confidence to navigate this maze of computerdom. Wanting to do something and finally figuring it out is just plain fun. I wonder if Bill realizes just how good that makes us feel? All totaled, we’ve had 1,973 people sign up for our membership at one time or another. If we can convert even half of those to a committed annual payment, that’s almost a real income! I love the membership website business model – and I believe we’ve just begun! If you hadn’t seen this before … check out the Forbes.com article, Running a Subscription Website from the Road, that was done about us and our web-business. Culture – Miami Beach: Last night was ‘Sleepless Night’ in Miami Beach. We were invited to go by Chris and Richard. Chris is my best-girlfriend from way back and Richard is her husband whose job is assistant director (I think that’s the title) at the Planning Department of Miami Beach. So, even tho no one could ever label Jim and me as night-owl, paint-the-town-red kind of people, we couldn’t pass up this opportunity to get a little culture. We started out with a delightful dinner at the sidewalk-café part of the Five Napkin Burger. It was a warm, beautiful, breezy night and we had a great time. Richard had gotten tickets (all free, but you had to get them online in advance) for the New World Symphony. We had second row seats and the Ravel selections were just beautiful. Richard snapped this photo. 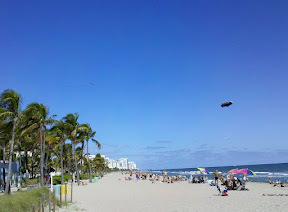 Then, we walked over toward the beach and saw this parade of giant sea creatures. The Miami Beach version of the Macy’s parade! We did finally make our way to the Vinyl and Kai night club and caught Richard’s performance. It’s so exciting to see a friend doing something that most people only dream of – way to go Richard! And, the band is really talented too! Good selection of Motown and Blues. But – I had forgotten how loud and crowded late night bar scenes can be. We had a great time, but we are not converted! Here’s the best picture I could catch of Cone of Silence. That’s Richard on keyboards. 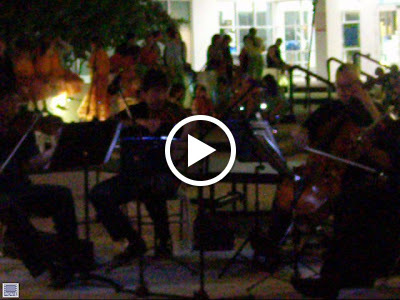 Follow the link for some videos of their performances.